Italian cities are rather like museums— long lines of visitors shuffle past one another and snap photos of famous statues and monuments in order to tick them off a “must-see” list. At their worst, they’re like historically-themed amusement parks, where perpetual crowds, umbrella-waving tour guides and selfie-stick hawkers crush any illusion of authenticity. In many of Italy’s most popular destinations, city centres are increasingly devoid of actual Italians—it’s happened in Venice and it’s happening more and more in Rome and Florence, as residents are pushed out when their rented homes are converted to AirBnBs and boutique hotels. So to find an Italian city that has everything a visitor desires, namely history, character, sightseeing and cuisine, that’s filled with residents instead of tourists and feels less like a living history museum and more like a living, breathing city… well that is indeed a rare combination. Bologna has it all—in spades. From Roman ruins and the world’s oldest university to its young, left-leaning populace and the palpable energy of an economy in full bloom (a real rarity in modern Italy), Bologna, despite being largely forgotten by the throngs of tourists that flock to the country, is one Italian city not to miss. Bologna’s only 5-star hotel, the ultra-luxe Grand Hotel Majestic lives up to its lofty name. In an 18th century palace along the porticos of Via dell’Indipendenza, just moments from the Piazza Maggiore, this plush retreat is part of the Due Torri hotel group, which has a portfolio of similarly high-end properties in Florence, Verona and Genova. The Majestic hits every grace note, from its grand marble-clad and chandeliered lobby to its old-world bar, Cafè Marinetti, where an item as simple as an espresso comes in a lidded cup aside a silver plate of chocolate and sweets. Dining options include a bar menu of small plates, plus a rustic-elegant wine cellar serving traditional Bolognese fare. The hotel’s I Carracci Restaurant, named for its ceiling frescoes, the work of baroque artists the Carracci Brothers, is one of Bologna’s most highly-regarded fine dining destinations. A newly opened health and wellness suite offers a sauna, a Turkish bath, a relaxation area and optional spa treatments. If the riches of Bologna didn’t beckon from beyond the heavy curtains, I might have been tempted to have never left my luxurious guest room. Silk sheets, fluffy pillows, antique furnishings and damask everywhere convey the feeling of being a guest at a royal palace. The bathroom was no less palatial. I tend to measure everything in relation to the size of my first-ever tiny apartment in Washington, D.C. That apartment could have fit into the bathroom at our Majestic suite—maybe even into the bathtub, a deep and roomy soaker set with fresh flowers and Trussardi amenities. Classic double rooms start from £264 (€310) in low season; and from £452 (€530) in high. Breakfast included. Free Wi-Fi. Grand Hotel Majestic già Baglioni, Via Indipendenza, 8, 40121 Bologna, Italy. You’ll need frequent stops for sustenance with all that walking, and Bologna offers a host of amenities. The city is often referred to as called la grassa, or “the fat one” in reference to its culinary offerings. It’s most famous dishes include a decadent menu of Italian classics, from tagliatelle or lasagna alla Bolognese (a rich, non-tomato-y meat sauce) to tortellini in brodo, as well as mortadella, the ubiquitous processed meat that has been bastardized into “baloney” in the U.S. and other places that regard their cured meats less passionately. For fine dining, traditional or innovative Bolognese fare, try I Carracci, the special nightly haunt inside the Grand Hotel Majestic, or Trattoria dal Biassanot for its homey setting and authentic flavours. For Michelin-starred dining at prices almost attainable for mere mortals, celebrity chef Bruno Barbieri’s Fourghetti is worth the short journey outside the city centre. We kept it light on sit-down meals and heavy on aperitivi (drinks and snacks), and that may well be the ideal way to sample the best of Bologna. It’s a city filled with young people, who come for university and stay because there are jobs. These educated, cultured and stylish Bolognans hit the streets, especially on weekend nights starting around 6:30 pm, (for happy hour drinks and nosh that often turns into progressive dinners). Just off Piazza Maggiore, the narrow Via Pescherie Vecchie is a hopping aperitivo alley, lined with tables and brimming with a fun, lively atmosphere. A bottle of wine, paired with heaping plates of charcuterie, cheeses, olives and artisanal breads will stave off thoughts of dinner, at least long enough to order another bottle. Nearby Mercato delle Erbe is a covered market by day and at night comes alive as a food and drink hall, with everything from chic wine bars to simple street food, all taken at long, communal dining tables. 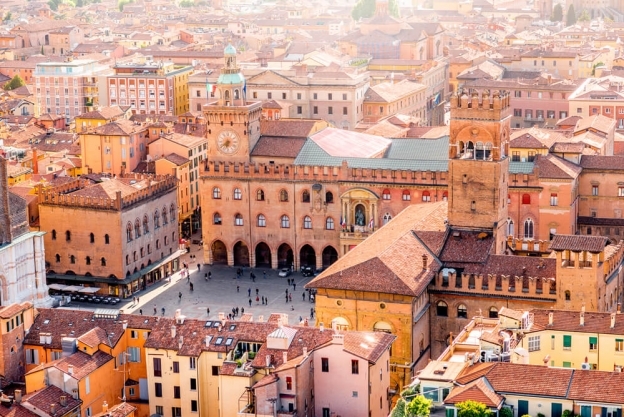 All roads in Bologna tend to lead to Piazza Maggiore, the vast and elegant city square that since Roman times has been the heart of the city. Lined with medieval and Renaissance palaces that now serve as museums and municipal buildings, as well as Bologna’s most important church, the Basilica of San Petronio, Piazza Maggiore stands out—even on a continent filled with grand piazzas—as one of Europe’s finest. On weekends, the piazza and most of Bologna’s centro storico (historic centre) are closed to vehicular traffic, and while you’ll burn a few calories getting around, the centre is flat and highly walkable. That’s thanks in large part to its more than 50 km of porticos, or covered walkways, which, apart from their considerable aesthetic appeal, keep walkers shaded from the elements. If your itinerary includes sightseeing, highlights on or near the piazza include the Basilica San Petronio; construction of this, the tenth largest church in the world, began in 1390 and continued for several centuries. Its façade remains unfinished. Consider also a visit to the Palazzo d’Accursio. The former city hall dates to the 1300s and now houses the Civic Art Museum. Wave at the 17th-century Fountain of Neptune before heading into the arcades of the Palazzo Podesta, in the centre of the piazza, to discover the fun “whispering walls of Bologna.” In the four-cornered vaulted archway in the centre of the palazzo, put your face towards one of the corners, while your friend does the same at a diagonal corner. When you speak into the corner, your voice will carry and “whisper” into the ear of your friend. Off the piazza, take in Le Due Torri, two landmark 12th-century watchtowers—one with a teetering 4-degree lean—that are the symbol of the city. You’ll pass them en route to the enchanting Sette Chiese, a complex of seven churches dating from the 4th to the 14th centuries. To understand the fascinating, turbulent history of Bologna, visit the worthwhile Medieval Museum. Bologna is the capital of the Emilia Romagna region, and is located about 100 miles north of Florence. Its main train station, Bologna Centrale, is a major hub for trains from all of Italy. Bologna’s Guglielmo Marconi Airport sees daily flights from London and dozens of European cities.